We design tailored wireframes for the main content areas of your planned website. Each layout provides a rough draft of where your content will be placed on the page in conjunction with navigation, logos, and functional elements. 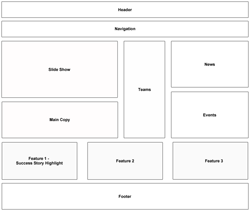 The goal of a wireframe is to validate all items are correctly represented during the planning phase of the project. You will see the site navigation develop, and we will want to know how much you would like to be involved in writing the content for your site. Images and multimedia ideas take shape to bring out the highlights of your services and products. If we have not already agreed on the prototype design, we will present you with several exciting mockups.